MainAll NewsJewish WorldTemple-Times Passover Sacrifice Nixed by Govt. Temple-Times Passover Sacrifice Nixed by Govt. Veterinary Services officials say they won’t authorize planned ‘practice sacrifice’ of Passover goat. Israel’s Veterinary Services will not authorize the planned public ritual sacrifice of a goat in honor of Passover this year, Veterinary Services representative Zohar Dvorkin said Thursday. Jewish groups dedicated to the Temple Mount and Temple renewal are planning the sacrifice as a reminder of what Passover looked like in Temple times. 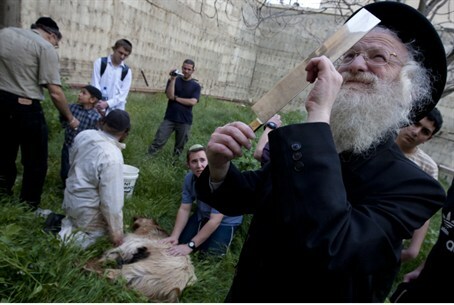 The ritual slaughter is to take place in Jerusalem, in the Armon Hanatziv neighborhood opposite the Temple Mount. Organizers said that the sacrifice would take place as planned on the Thursday before Passover with or without government approval.